The story of Terms of Endearment should flood the audience with tears. The Directors Company production could not even come close. 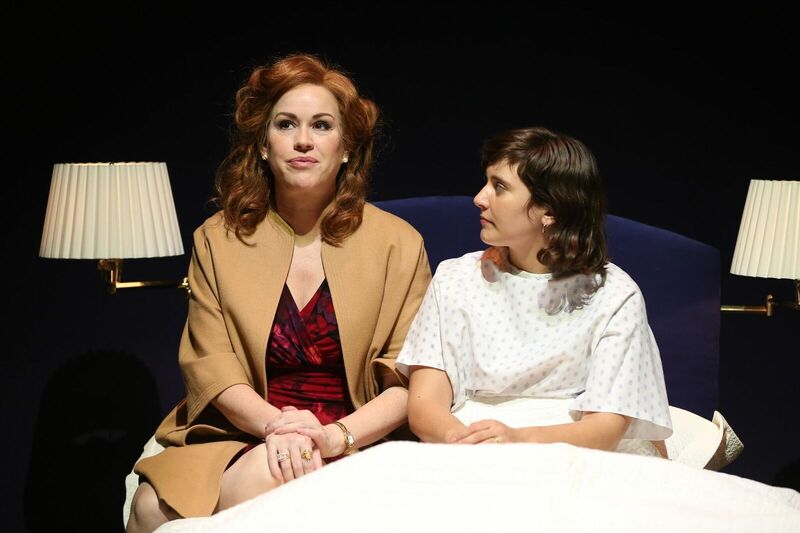 Adapted for the stage by Dan Gordon, which is based on the novel by Larry McMurtry and the screenplay by James L. Brooks, and presented by The Directors Company at 59e59, Terms of Endearment proves that not every story belongs on the stage. Terms of Endearment is the classic story of mother and daughter who battle a litany of personal struggles that bring them closer together as time goes on. Spanning two decades, widowed Aurora tries to keep her only daughter Emma close by. But when Emma is forced to move from her Texas home to a new life in Iowa, Aurora is left alone and must combat it while Emma is in a dull marriage with a man her mother disapproves of. The story comes to a close with the iconic plot twist of Emma's cancer, causing her mother to feel as if she lost it all. Even if you know the story or not, Terms of Endearment is a guilty pleasure for the desperate housewives. Even if you can get past the frothiness, this script is stuck in a cinematic mind-frame. Dan Gordon’s Terms of Endearment is flat-out frustrating, if not infuriating. The script is superfluous. The direction lacks rules and guidelines. And it’s all due to how it is structured. With the book and movie clearly on the mind, Gordon jumps from location to location, spanning a long string of time. With such short bits, director Michael Parva must figure out a way to make the overall arc resonate while honoring the text. Only Parva is forced into limitations that cause him a world of woes. The segmented set designed by David L. Arsenault causes headaches beyond belief. And that goes beyond the disconnect of the underutilized and distracting scrim which doesn’t quite live with the rest of the set. With so many locations and so little stage space, Arsenault’s scenic elements are introduced in nearly every scene. But reality wise, it lacks sense. There’s only so much disbelief one can take. With raised areas housing various scenic pieces, Parva asks his company to break walls, and space, in order to create a necessary visual and staging that doesn’t lag. With such a strong focus on the use of the phone, there’s no such thing as a split screen in theater so having both Aurora and Emma sit on the same bed in separate locations just to have the visual calls into the overall aesthetic into question. Parva absolutely needed to go full theatrical to make this text work. He did not. Going back to Dan Gordon’s script, this production is very much a “period piece.” The themes present live in a specific time and yet they are still universal. The original source material was never a period piece so why not update this play to today? Sure, there are some major advances in technology but wouldn’t that hammer in the power of a long-distance relationship? Gordon tried to play it safe and it just did not work. Lead by the legendary Molly Ringwald and rising star Hannah Dunne as mother-daughter duo Aurora and Emma respectively, this ensemble did all they could with tough material and rough direction to navigate. As the oft-hysterical widow Aurora, Ringwald tapped into the super-critical character. With the movie so prevalent in this production, in comparing to Oscar winner Shirley MacLaine, Ringwald made Aurora her own, lacking the bite and tenacity MacLaine brought. Ringwald had an endearing sweetness that fell into undying sadness when things didn’t go her way. Hannah Dunne is a natural as Emma. Dunne is full of life and hope. Of all of the cast, Dunne was the strongest at making Gordon’s cringe-worthy text believable. It’s hard to understand why Aurora wouldn’t want the boy-next-door version of Flap to be married to her daughter. Denver Milord was not the Jeff Daniels version of Flap. To no fault of his own, Mildord was the perfect all-America charmer. There was something discomforting about Jeb Brown’s Garrett. There was something false in his Garrett, causing Brown to appear quite cartoonish. I could go on and on about the flaws of Michael Parva’s direction but deep down, with a cinematic text, there was no way this production of Terms of Endearment was going to be able to properly find hope. The story should be full of humor and heart and yet The Directors Company production lacked all semblance of both.